If you like it, I think that you can vote for the project and, maybe, just maybe, I’ll win…yippee! Future Weather–Is Wind Worth it or Does the Sun shine Through? I’ve been doing a lot of thinking about just how much power we are going to need to live a full and trouble free, zero carbon lifestyle in Spain. You’ll have gathered from some of the other posts that the energy principle that I’m following is “no carbon brought to the land”. If it’s here already then it’s fair game – and, no, we haven’t struck oil. I’m thinking of wood from trees and water from the ground although there’s not a lot of carbon in wood, but I just don’t want to cave in and use gas or oil to cook and heat and I’d really rather not have a backup generator if it’s avoidable. For starters, a decent 10KW diesel generator will set us back several thousands pounds in capital costs plus fuel over the years both of which could be better spent on other sources of energy. I’ve calculated that 15KW of solar panels will give us a huge abundance of energy in the summer and by using my automatic panel angle adjustment system I should be able to optimise the power that’s available in the winter. Clearly, the colder season is when we get the least sunlight so making best use of what energy there is is the key to success. If you’re bored one day, type “off grid” or “off grid living” into Youtube and have a look at what other people are doing. There are a serious lot of preppers and hippies out there! The preppers are generally happy embracing technology, but the hippies tend to shy away from it apart from, I notice, the use of gas for cooking and showers plus Apple Macs, for some reasons. Amateurs! Electricity is the way to go. Or wood if you’re a masochist and just looooove cutting and hauling trees. Some tests I did last summer (http://www.offgrid.casa/testing-solar-panels-in-the-uk/) when we finally managed a couple of sunny days in Northumberland, showed that we can potentially get around 80% more energy from the same panels if we adjust their elevation angle throughout the day. However. Having spent a week in deep snow in Matarranya in February, it’s clear that there are periods when the sun simply hasn’t got his hat on and is unwilling to put in anything but a fleeting appearance. Yes, there will always be some light but if it’s as pale and wan as a teenage goth after a breakup with his girlfriend then it could be a small fraction of what’s actually needed, especially on long, cold winter nights. So, what to do? There’s another source of zero-carbon zero-cost power available of course. Wind is often more prevalent in the winter than in the summer, but exactly how much? True to form, rather than taking the easy route I decided to design another gadget. This one is a neat little device that measures solar and wind power on a minute by minute basis. It also takes readings of temperature, pressure and humidity as a by-the-by. It occurred to me that having all of this data logged over the next year might give me an idea of how much combined solar and wind power I could expect over a 12 month cycle. With a bit of Google “research”, I reckon that the best type of of wind genny is the horizontal type. To those with an engineering disposition, reducing the stress on moving parts of a machine is always a good idea. The traditional Dutch style windmill with vertical blades have a huge amount of shearing stress on the bearings which hold the hub and hence the blades. The hub and shaft are horizontal, so the weight of the blade assembly is trying to twist the whole thing downwards to rip the windmill apart. If you are of a voyeuristic leaning, have a look at these youtube videos and be prepared for the shocking truth about wind power – Notice anything? Yes, all of the catastrophic fails are of the Dutch style windmill. Horizontal wind generators have the advantage that all of the weight of the blades and turbine assembly is acting straight down where the bearings are located. In theory, there’s nothing stopping you from using magnetic or even mercury bearings to avoid any real wear. So, I ordered a little horizontal anemometer from Maplin Electronics who, as I write this, are in the process of going bust and have a huge sale on. So, mercenary that I am, I took advantage and bought the complete stock of our closest store, which amounted to four, 3-cup twirly wind measuring devices for the princely sum of £1.74 each. With a small amount of destruction and the sacrifice of one unit, it became apparent that the sensing device in these devices is nothing more than a simple reed relay which is opened and closed by the action of a pair of small magnets as the vanes rotate. So, simply counting these pulses in a fixed time period would give an indication of wind speed. In the Maplin case, there are two pulses per rotation. The distance travelled in each rotation is 2Πr so in theory the distance travelled in one rotation per second would equate to the wind speed. However, it turned out to be a fraction of the actual value. If you look at the top left of the anemometer picture, you can see a little, cheapie yellow and black, Ebay hand held wind speed meter which I used to check this. I set up a small desk top fan that we use to keep cool when we’re travelling to give me a constant wind speed and it became apparent that my measurements were in fact out by a factor of two or three. Hmmm. What was going on? I came up with a theory, correct or not it appears to fit the facts. 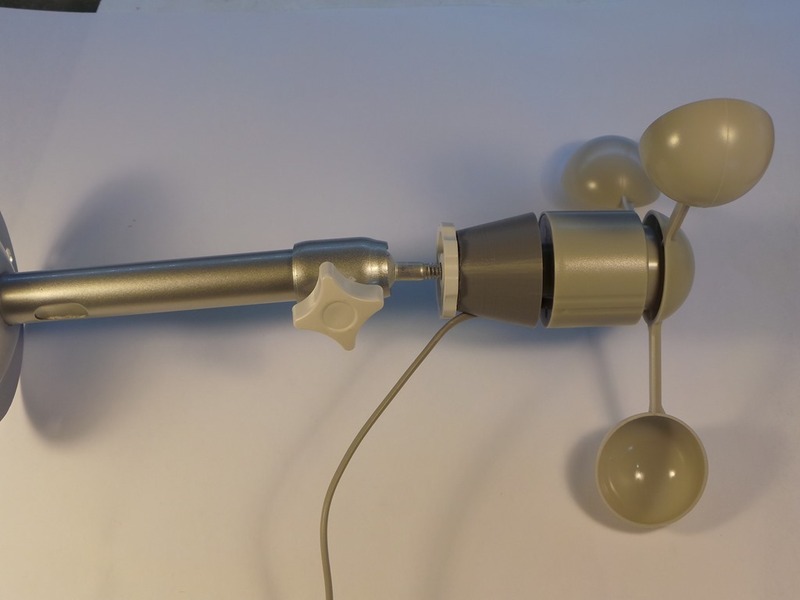 The wind acts on both sides of the cups of the anemometer, but as one side is convex and the other concave the effects are asymmetrical, so the vanes only turn in one direction. 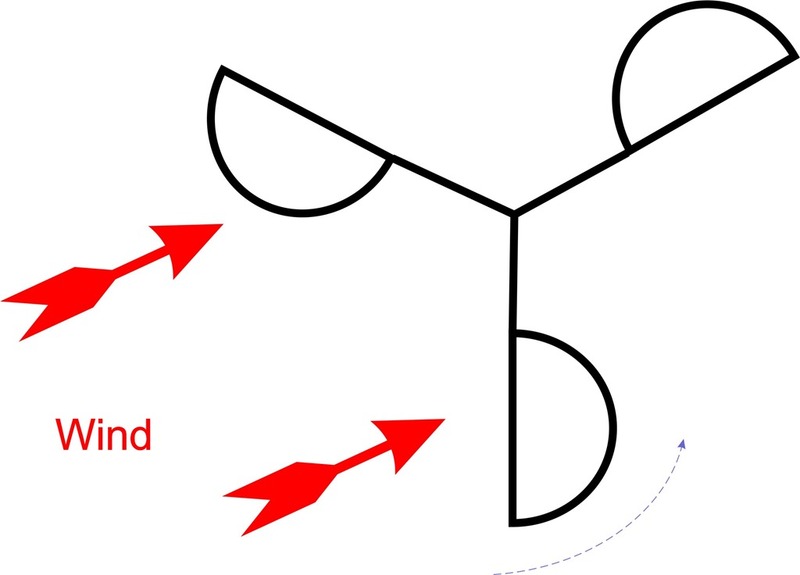 As the vane turns, one cup will face into the wind as another one is catching it, but the surface is curved and streamlined so the drag is reduced. All of this leads me to realise that the anemometer won’t turn at the same speed as the wind is travelling, so a fudge factor needs to built in and this is what I did. A little bit of experimentation led to a fudge factor of 3.16, which is suspiciously close to the value of the universal constant Pi (3.14159). I surmise that there’s an equation to correlate the rotation of these anemometers to wind speed and it includes a Pi factor which I’m missing. However, hey ho, it works and seems accurate enough for government work, so it’ll do me just fine. So, the circuit incorporates a display so that I can see what’s going on and check what’s happening with power, wind and environmental variables such as temperature etc. 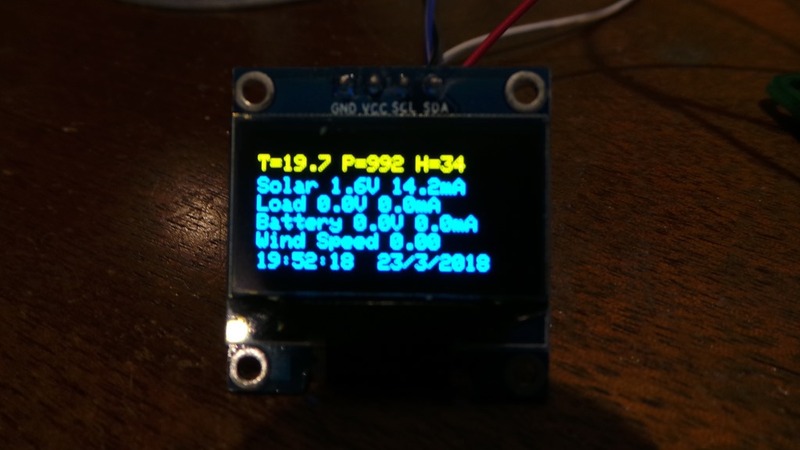 I also put on a couple of buttons so that I toggle between displaying the current instantaneous values and some simple graphs of temperature, pressure, humidity, various solar and battery power readings and the wind speed. Here’s the final weather station circuit board and the display showing the basic solar, weather and wind information. Note the two blue relays on the board. These are in case I want to be able to turn anything on or off – e.g. an infra red flood light for nocturnal animal observation with the webcam or to reset anything that needs it’s power cycling. I’m thinking of a getting a T-Shirt with “Have you turned it off and on again” as that’s what I say to the wife pretty much daily when something doesn’t work. I needed something to hold the anemometer in position and to be able to level it to the horizontal, bearing in mind that all of this kit is going to be mounted in Spain on a 400 year old roof beam that I’ve stuck in the ground and tethered with some fencing wire. Resorting to Ebay, I found a wall mount for a camera for about £3 which looked like a likely candidate. However, it has a standard camera screw mount and my anemometer is actually a replacement part for some random, Maplin weather station so the two are not in any way, shape or form compatible. 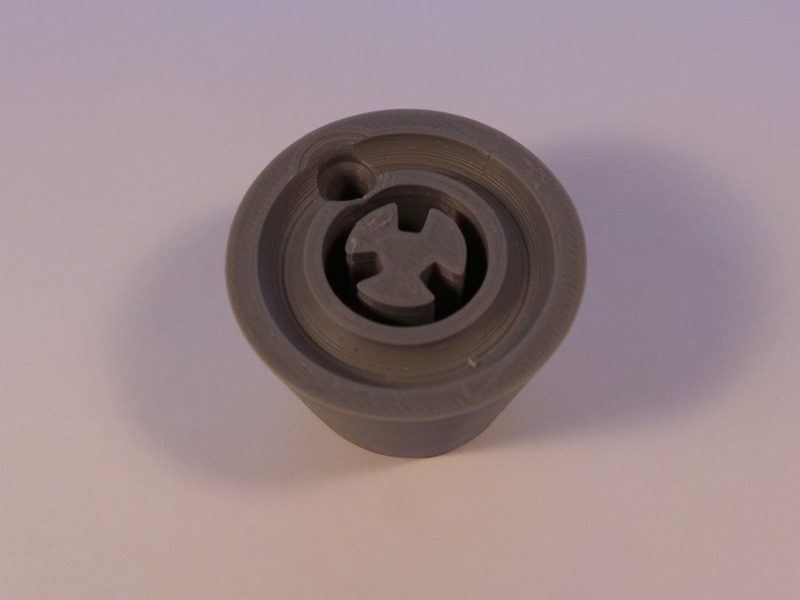 Thankfully, my trusty Robox 3D printer came to the rescue…plus half an hour on a CAD package – resulting in the little conical mounting bracket shown here. 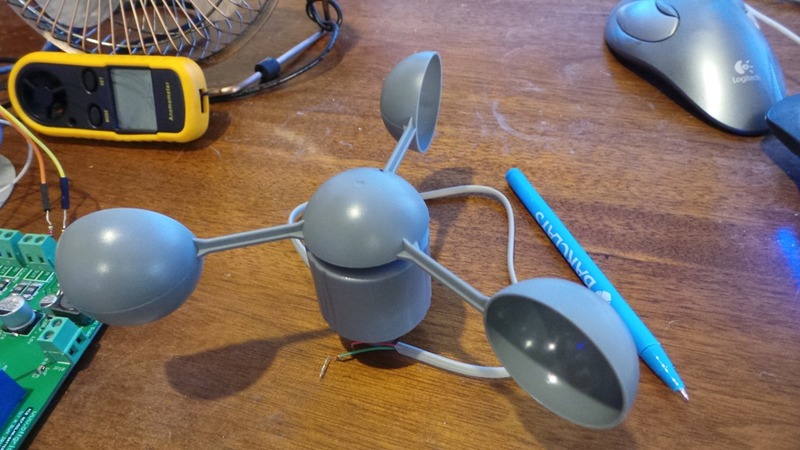 The odd sort of cross shape in the middle matches up with the base of the anemometer and I’ve even put a cable hole in to stop the wires from fraying in the wind. The whole thing then screws onto the camera bracket and off we go with an easily levelled wind speed measuring doohickey. What did I ever do before 3D printers were invented? So, now the hardware is finished, I need to mount the lot on a roof to test it all out , make sure that it’s reliable and check that my software gives me everything that’s needed. Rain, rain, please don’t go to Spain..too late! In late August/early September, we went to Matarranya by car so that I could take some equipment to set up a webcam to watch the building work on our house as well as keeping an eye on the local wildlife. We thought that it would be a great laugh to buy a tent and actually sleep on our land for the first time. Everything was very dry, it being full summer and we anticipated no problems. An easy decision was made to stop over in the lovely town of Logroño in north western Spain because it wasn’t far off our route. Primarily, this was because we had watched Alex Polizzis TV series on Spain and the tapas in Logroño looked fabulous. Well, it didn’t disappoint. There are hundreds of tapas bars, small and large, with thousands of people wandering the baking streets and sampling the delights. As the sweltering day meandered into the cooler, more bearable evening the tapas came on display and the street feasting began. Like vast herds of wildebeest, the local Spaniards graze their way from watering hole to feeding grounds and we followed like an Attenborough camera team. As the evening progressed, more and more we saw La Trompa, the local name for the drunken walk during a well refreshed night out by the local wildlife. I think it describes the trumpeting sound made by an elephant so if you imagine the way in which elephants walk, swaying from side to side, you get the idea. Sadly, we’d only planned one night stop in tapas heaven and only a few hours drive saw us pulling into our local town of Valderrobres. We had booked an apartment for the week, the whole camping thing being just a bit of fun. With temperatures hovering around 42 degrees, I was ready with portable fans to stop us turning into small, sweaty puddles in our flimsy tent. The countryside was dry aftera couple of months of little or no rain and baking sun. Our olive trees, whilst laden with fruit, were looking rather sad. The olives had a shrunken, shrivelled look and were clearly in need of a serious drink. I did despair slightly that the crop might be ruined due to the lack of rain. Of course, I needn’t have worried as, being a rain god, those heavenly droplets can’t resist falling on me and about an hour after setting up camp, the heavens opened and a huge storm hit. What is it about tents, Brits and rain? It must be in our DNA, I guess. It rained heavily overnight for about 12 hours, the water got in everywhere and we were soaked throughout the night…at one point, I seriously began to wonder if the tent was going to be lifted up with us inside and blown over the cliffs; an ignominious end to our Spanish Dream in a broken heap at the bottom of the valley. Of course, with the storm also came hailstones and plummeting temperatures. We had only taken thin sheets, anticipating baking not freezing and spent the night huddled together, extracting heat from each other like a pair of thermal vampires. As the first light broke, I was fully awake to see that the clouds had more or less cleared and I was greeted with a glorious dawn breaking and the welcome return of the sun as it streaked across the mountains. It’s welcome warmth encouraged me to venture out to forage (in the back of the car) for coffee-making and breakfast materials. We’d had a visitor during the night, a fox by the looks and smell of it. There wasn’t too much damage, but the remains of last nights supper was nibbled and spread around the campsite, although that could have been helped by the wind during the night. Next time, I’m setting up the game camera! We’ve already taken some pictures of a large-eared fox at the watering hole, so maybe it was our nocturnal visitor. I bought a fabulous camera from Ebay with full control of pan/tilt and 18:1 optical zoom in a weather proof enclosure. Of course, as we have no power systems installed yet, clearly the only option was to build a standalone solar battery system. The picture shows how I mounted it all. Basically, I found an old beam from the demolition of the house and dug it into the ground. Unfortunately, I could only dig down about half a meter until I hit rock and, lacking any large drilling tools, I couldn’t go any further. However, I found some old wire fencing which had been part of a sheep enclosure and stripped it down so that I ended up with a length of galvanised wire. Three of the heavy tent pegs were rapidly repurposed to hold the stays in place and the control box was mounted at the base of the post as you can see in the photo. The box contains the solar battery charger and a mains inverter to convert the 12V from the battery to 240V to power the camera which is, oddly, powered by AC instead of the more usual 12V or 5V DC. The battery is visible at the back of the post, on the ground, wrapped in bubble wrap to protect it from the cold during the winter. Lead acid batteries aren’t too fond of freezing temperatures, so a bit of insulation goes a long way. The camera is sitting on top of a rocky knoll which overlooks the small plateau where the house is situated and looks across the valleys and hills towards Peñarroya de Tastevins which will be the source of our wimax internet access. These photos show the control box with a close up of the little charge monitor that I decided to incorporate just to check that everything is working well. It shows the battery voltage, the charging current, the instantaneous charging power and the total amount of power generated by the solar panels. Sadly, it being August, we couldn’t get anyone out to install the internet system so the exciting bit is yet to come. I’m heading back down to Spain next week to meet up with Jordi who is going to install our wimax dish which will give us a 15 Mb/s data rate, which is way faster than our UK home system. I’ve just come back from Mattaranya and have had the WiMax intenet access system installed. positioned. In fact, I could pick up the access point wifi signals on my Android tablet, it’s so strong! unfortunately, I discovered that the combined power consumption of the camera, wimax antenna and the router is a bit much for the leisure battery to last overnight – probably due to couple of cloudy days and the cold nights now, which force the camera heater to engage. So, for the moment I’ve had to install a timer to turn everything off at night. My new project is to design a circuit to monitor the charging power and the battery voltage and to turn the camera system off when the battery voltage reaches a preprogrammed level to preserve the rest of the system. As a bonus, I’m going to connect this unit via the internet with my Raspberry Pie in the UK so that I can monitor the power generated by the solar panel and the amount consumed by the electronics. This will be interesting in itself as it’ll give me an idea of how much power I can expect to be generated by the larger solar system throughout the year, when it’s installed. As a final extra, I realised that whilst there isn’t much wind in the summer, there can be a decent amount in the autumn and winter. So, I’m now investigating putting a small wind generator on the camera pole as well. I’ll monitor this along with the solar panel and the next year will tell me if it’s worth installing, say, a 1 kilowatt wind generator as an adjunct to the solar panels so that we never have to rely on a generator. I’ll do a separate update on this as the experiment progresses. Is it all worth it? I mean really? In order to convince myself that it’s worth all the hassle and cost of making my solar panels self-adjusting, I thought that it would be a rather good idea to see what difference there would be in power output by changing the angle of the panels in a real life situation. So, despite the almost constant rain here in Northumberland this “summer“, I managed to find a vaguely dry day on which to set up a bank of three panels on the flat roof of our Pele tower. This roof is covered with zinc sheeting and is like an ice skating rink when it gets even slightly damp. As there’s been more-or-less a lake up there for the last couple of months, I’ve avoided going up there like the plague in order avoid killing myself. However, there are now finally three panels in place. Fortunately, getting up there is reasonably easy even though it’s up a 1000 year old, medieval spiral staircase and the panels only just sqeeeeezed through. Clearly, they were planning more for defense against armed marauders than manhandling large aluminium and glass panels up on high. Who would have thought it? I constructed a light, wooden frame to hold the panels and attached the linear actuator and a pair of 400 newton (40 Kg) gas lift struts. The first time I attempted to adjust the panels using the linear actuator, it became immediately apparent that the struts lifting capability was way too much as the panels started to warp as the actuator and struts fought against each other. So, on to Plan B when we get a break in the weather. This consists of fitting four smaller, 100N (10Kg)struts, spaced equally along the array to give an even lifting assistance to the actuator. I figure that four struts will also help greatly in stabilising things if it gets a bit windy. I also fitted a small length of 50mm x 50mm, 3mm thick steel angle iron to the junctions between the panels to give them more rigidity and to reduce any potential bending or warping of the panel frames. One additional advantage of the smaller gas struts is price. The larger ones are about £18 per pair, whereas the small ones are £1 each, even though I’ll probably need to use all four, that’s quite a saving when I’m putting up 18 solar arrays. To do my tests regarding adjusting the panels throughout the day to track the elevation of the sun, I need a totally cloud free day. Hey, it’s August in England, you’d expect a bit of sun occasionally wouldn’t you? Well, you’d be wrong! So far, I haven’t been able to carry out any tests whatsoever, other than putting what meagre amount of power is penetrating the clouds into my batteries. Who wrote that autumn is the season of mists and mellow fruitfulness? Well, we’ve had the strawberries, the red currants, the black currants, the gooseberries and the plums, so lots of mellow fruitfulness there. We’ve had/are having the mists and the rain, so is summer in the UK actually now autumn? The graph on the right shows the power from the panels for the last four hours. The blue graph is the electrical power being generated and the red one is the DC voltage of the array. I find it interesting that the MPPT solar battery charger inside the PIP4048 inverter/chargers only takes just as much power as the panels will give, so the voltage stays within a reasonably constant range. There keep on being brief periods when the sun peeps out from behind the clouds, just to see if we’re wet enough down here. A couple of hours ago, for one gloriously brief moment, I was getting 536 lovely watts surging down the wires from the roof into my circuit cellar. In theory, in decent sunlight, I should achieve up to 745W, but so far no joy, no way. My aim (dream!) is to have at least one totally, gin clear day so that I can log the power generated at different angles of the panel. Clearly, when they are face on to the sun, that should be the maximum power point. I have incorporated the ability in my little solar panel tracking units to be able to over-ride the automatic tracking facility and just force the panels to any desired angle. This will mean that I can assess the different angles that people use for their boringly, fixed arrays and see how much extra juice they’d have to play with if they were to install trackers. Well, that’s the theory anyway and until we get some proper sunshine, that’s where it it’ll stay – in the land of untested theory. I’ll update this post when or if the weather improves and I can get out onto the roof without risking life and limb, hopefully with some pictures of the final setup with the new gas struts. We had a brief gap in the rain, so I managed to get a couple of outside jobs done and then got up onto the roof for an hour or so before the heavens opened once more. Here is the result of connecting three 24 volt panels end to end, giving me in reality between 70 and 90 volts depending upon the sun or lack thereof (more likely at the moment). I’ve bolted the frames together and then put some 50mm x 50mm steel angle iron along the tops to stiffen the whole thing. You can see that I’ve mounted them in sort of landscape format rather than the usual portrait layout you often see in solar farms in the countryside. The reason for this is that those panels you see dotted around in fields are on fixed frames, so they are stiffened at both ends making them more stable. I only want to use one linear actuator mounted in the middle of the central panel rather than one at either end, just in case one of them failed, I don’t want the array to be warped by the still functioning actuator and the panels potentially cracked. Below you can see the back of the array. There’s a stiffener (steel angle iron) which I’ve mounted in the centre of the middle panel to allow me ato attach the linear actuator. This at least means that the forces across the array are fairly constant and therefore less likely to crack the panels as they are being adjusted. You can see the small 12V battery that I’ve using to run the actuator whilst setting everything up – it allows me to extend and retract the actuator to check that everything is working. Once I’m happy with the design, I’ll throw a cable down int the light well which is to the right of the picture over the wall and down into my workshop where all the magic is happening. Here’s a closeup of the actuator – you can see that the way that I’ve mounted it makes it look like it’s upside down. In fact, having the motor at the top and the piston pushing down helps to reduce the potential for dirt or water getting past the seal. There’s also a lubricating mechanism inside which only works when it’s this way up. I’m considering putting some kind of water proof fabric shield over the whole of the back of the panels to protect cables, actuator and gas struts from the dust and weather, however putting the actuators and the struts the right way up is a good start anyway. I installed two of the 100N gas struts – you can see one of them at the end of the panels above – but, I don’t think that they’re quite meaty enough for the job as I had to mount them at quite a shallow angle so that their limited travel wasn’t a problem as the array moves. Never mind, I’ve got four 200N versions winging their way from Hong Kong as I type. So, four of these little beauties should in theory give me about 80KG lifting capability which is more than the array which weighs in at 60KG. However, due to the position and angle that I’ve placed them, I’d be surprised if I get more than about 20KG lift which is just enough to stabilise everything in strong winds and to reduce the load on the actuator. Things are getting very exciting now as we have the final plans for the house and we’ve been to see the local major to get his opinion, which was very favourable thankfully. Amongst other things, we’ve agreed the location of the solar farm with Fernando the builder who is going to build the garage, the battery/inverter shed and put in the concrete bases for the panels. You can see from the diagram on the right that the solar farm will be about 200m from the house. The cables from the panels will all go into a shed which will house the batteries,the charger/inverters, my monitoring and control electronics and a backup generator just in case of really bad weather in the winter. All I needed was a bit of consistent weather for my comparative solar tests and I’ve been waiting weeks to get it. Well, finally today was the day! I’ve had a window of opportunity lasting for over two hours now where the sun was shining. Well, I say “shining”, but there is a lot of high level cirrus cloud probably indicating an approaching weather front, so it’ll probably rain again tomorrow, or it may be sunny. Who knows? Anyway, the point is that it was at least consistent and whilst I didn’t get as much power as the panels are capable of producing, I could see what difference angling them to the sun made to their output. 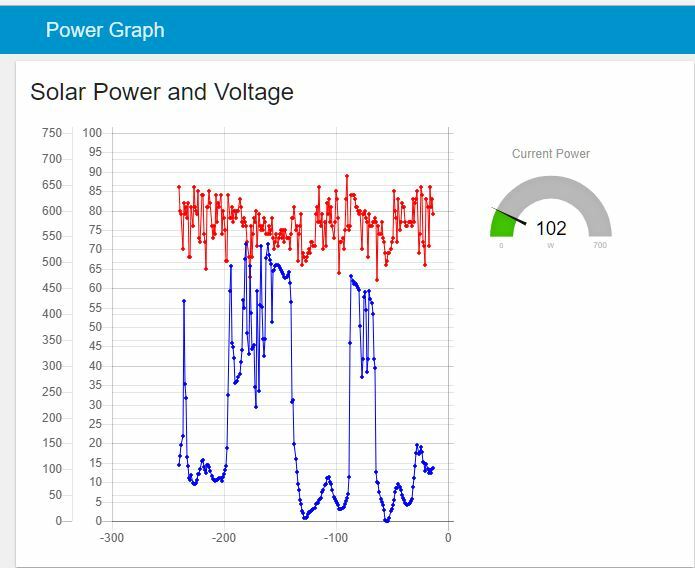 As you can see from the power graph here, at around 16:05, there was around 360W being produced and the tracking unit had set the panels fully face on to the sun. I then adjusted them about 30 degrees away from optimum and the power dipped by around 90-100W just after 16:07. I then brough the panels back through the optimum position and up to the maximum angle of around 80 degrees, in other words almost vertical and the power output plummetted to around 50W! I wasn’t expecting that much of a drop, I have to say. I then let the panels be set back to the optimum angle by the tracking unit and the output went back up to just short of 400W. So, it looks as if tracking the suns elevation is definitely worth while as it can make a huge difference to the power output. This is exactly what I wanted to find out, so the question has been answered, it does look as if it’s worth while adjusting the panel angles throughout the day and throughout the seasons. Well, I’ve designed the printed circuit board (PCB) for the solar panel tracking system and the prototype hook up on the bench appears to work very well, although I’m waiting for some new gas lift struts to work with the linear actuator to take the load off the motor. We’re going over to Spain again this coming weekend to meet the builder and to actually poke some marker sticks into the ground showing where we want to place the workshop/garage, the solar panel bases and the little shed which will house the batteries and inverters, so it’s nice to see some progress. At the moment, I’ve just screwed the panel and actuator to the floor in my workshop, however I’m intending to bolt the stuff directly down to the concrete bases that will be poured in a few weeks time with a little bit of luck. The first pair of gas lifts struts that I bought from EBAY were dirt cheap, but like anything cheap you get what you pay for! Unfortunately, the struts aren’t adjustable so both struts give a total lift of 120KG so it’s way too much for my panels which weigh in at 20Kg each or a total of 60KG. In the videos you can see some of the circuit boards that will connect to the PIP4048S solar charger/mains inverter together with the 8-way solar panel power monitor. These also connect to the panel tracking units to allow me to monitor them for faults and to pass information such as the date and time across to the trackers – this obviously needed for the trackers to position the panels at the correct angle at the appropriate time of day. I’m not relying on any kind of sensor to locate the sun as that could cause issues when it’s cloudy and I don’t want the panels hunting for the sun unnecessarily. You can see in the video clip that I’ve decided to lay the panels on their side, effectively in landscale rather than portrait mode as, again, I want them to be less susceptible to wind. Lastly, the hinges that I’m using are ball bearing hinges intended for very heavy doors. I intend having three hinges per set, one hinge at the outer edges of the panels and one directly in line with the linear actuator in the middle of the central panel of the three. It’s getting quite exciting here in Northumberland as I’m actually seeing the stuff coming together. Now all I need is another 51 panels and 6 sets of control electronics, 18 linear actuators and 36 gas lift struts and Bob’s your Auntie! (we’re equal opportunities Up North and if Bob wants to be an Auntie instead of an Uncle, that’s his right). The hinge that I’ve selected is just a 100mm, ball bearing hinge that would be used on a very heavy door and so should be fairly long lived. Oh, and it’s stainless steel. Everything is going to be stainless steel as I don’twant rusting anywhere. 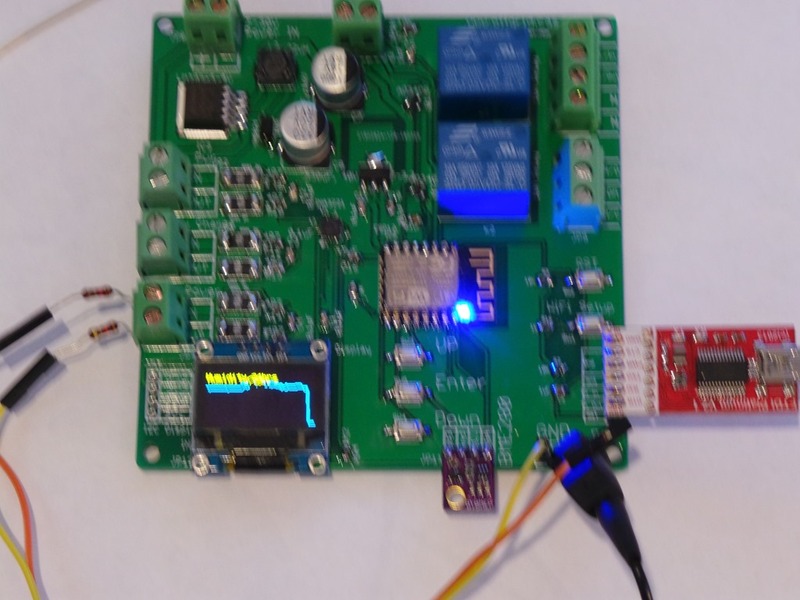 You can also see some of the other circuit boards in the viceo clip including the interface to the PIP4048s solar charger/mains inverter and one of the 8-way solar power monitoring boards. Here’s a neat little excel spreadsheet that I’ve tinkered together to check the maths for the angle of the solar panels. Just type in the time e.g. 9.25 is 25 past nine, the date and the latitude of your installation and the final box will give the angle of the sun above the horizon. Don’t adjust for summer time as it actually needs solar time. So, I’m working on the software to go in my solar tracking circuit that will use a light sensor to measure the length of the day and then make an approximation of the date and time and use that to track the sun… Fingers crossed! I had a brain wave and realised that if I plugged in a satnav GPS module then I could get the latitude, longitude, time and date. From all that, I could then derive the time zone and thereby calculate the solar panel angles, all without setting up anything manually. The result? Well, a $3 module plugged in and it works! I’ll update this with some pics when I get a chance. We’ve just had a power cut at home in Northumberland and I’m currently running on my test PIP4048 mains inverter and as the sun has gone down and it’s been raining all day, I don’t have a huge amount of power available. Helen has been away with a friend in Crete for the last few days, so it’s given me some time to bring a few solar ideas together. I built the prototype interface circuit board for my PIP4048 solar charger/inverter and discovered a better way of doing one or two things, so I decided to re-design the circuit board. Amongst other things, I decided to change the ethernet network interface to a different chip, moving from the Wiznet W5100 to the much better W5500. I also separated out the way I bring in the data from the solar power monitor as there was a issue with it sharing a data connection with the W5100 network chip and even though I’m going to use the W5500, I wanted to be sure. Safety first. I’ve had a go at laying out PCBs for network interfaces in the past, but for some reason, I’ve never managed to get them working. So, to save me any potential bother, I’ve also put on a 10 way connector just in case I have to use an off-the-shelf network interface. You can see the network circuitry on the right hand side, middle of the PCB, surrounded by a white box. I also thought that it would probably be a good idea to add a fuse, just in case! You can also see a round object in the bottom left hand corner, this is a battery to run the real time clock which is there in case the unit loses network connection and can’t access the current date and time from the internet. This is needed to calculate the solar panel angles throughout the day. I’ve also finalised the design for the solar panel tracker. If you’ve read the other posts, you’ll know that I’m using cheap, 12 volt linear actuators to change the angle of the panels throughout the day. Here’s the PCB. I was originally going to have nine solar panels in one huge array, all being adjusted by a pair of linear actuators. This turned out to be rather cumbersome and would have required a pair of laser sensors to make sure that the frame holding the panels wasn’t twisting. Much as I love the little laser distance sensors, I realised that a much more straightforwards way of doing things would be to have only three solar panels on one frame and a single linear actuator to adjust them. I’ve picked up a pair of gas struts from Ebay which are meant as a replacement for the rear hatch of some car or other, but they’ll each lift 60KG, so one of those plus the linear actuator should be quite adequate to lift up the 70KG or so weight of three panels plus the frame. I’ve also ordered a pair of 150mm stainless steel, ball bearing hinges to allow the panels to be fixed at the base and to rotate as the actuator moves in and out. I’ll post some pictures when the first three solar panels turn up. The solar tracker design will handle up to three sets of three panels independently movable. You can see on the PCB design above that there’s a 4-way connector at the bottom left marked “solar panel”. I’m using 4-way lighting switch cable as it’s real cheapo stuff and easily available. The idea is that I’m only going to move one set of panels at a time, so I’ve allocated a wire which is common to all three panels’ linear actuator. Then, I can just use one of the other three cable cores to power each of the individual actuators. I guess that the main point of all this is that I can put the solar trackers inside the battery/inverter house out of any weather and just run out a cheap, 4-core cable to a weather proof junction box beside the panels. Oh, and I was on a roll this morning so I decided to do a little three-way junction board to save me having to mess with choc bloc connectors when I wire the panels up. The four way connector on the left brings the control power from the solar tracking unit in the battery shack and then it’s just simply split into three, 2-way connectors to hook up to the linear actuators. I haven’t finished all of the software to run all these boards yet, but I do have all the basics in place. So, the PIP4048 monitor board is talking to my house network and the Raspberry Pi that runs everything and is also currently plugged into the PIP4048 inverter/charger via an RS232 serial line. It reads various parameters from the PIP every 10 secods – things like total solar charging power, battery power available and total power consumption. Above, you can see an extract of some of the data monitored via the MQTT protocol on my Raspberry Pi. The top four lines show up to 32 solar panel current values. In fact the first three sets show ‘255’ eight times as they aren’t actually connected to anything. The 4th line shows that there’s a small amount of current, between 100mA and 200mA going through each of the eight solar current monitors lines. The rest is fairly self evident. I’m running a my workshop heater via the PIP so ‘pip4048Monitor/from/loadPercent ‘is showing 20% of maximum load as it’s a maximum of 4KW and I’m using an 800 watt heater. In fact, the bottom value is ‘acActivePower’ which is showing 828 watts so that matches up pretty well. The other stuff is mainly to do with battery charge current, battery level etc. So, as you can see, I’m fairly close to having a complete solar control and monitoring system for the offgrid casa! How do you turn a light on? Simple, of course, you flick a switch. What if you have lots of separate lights to turn on or off, well you walk around the house flicking lots of switches, surely? You could go to the main circuit breaker and just switch all of the lighting breakers, but that’s a bit extreme. So, at the risk of re-inventing the wheel, I decided that the offgrid casa needed something new. How about networked lighting control? I looked at existing houses and it’s unlikely that any one room needs more than three lighting circuits – say, overhead light, wall lights and maybe low level for mood lighting. So, I turned to the trusy ESP8266 wifi processor that’s the basis of many of my projects and came up with a neat little design to handle three lighting circuits. Using a network linked device means that remote control becomes a possiblity. Budding electricians amongst you know that in traditional lighting circuits, you can only have two switches on any one circuit as it becomes far more complicated to handle more than two. So, you end up with a switch on the wall as you walk in one door to a room and the second as you go out of another door. What if you have three doors or want another switch at a more convenient location? Well, there are systems which allow you to have multiple switches using changeover relays – more commonly used in stairwells in apartment buildings. We press once for on and again for off. This is the system that I decided to use. However, instead of a relay, the ESP8266 wifi processor has three inputs and three optically switched outputs, if you look at the picture above, you can see them at the top of the circuit board. There’s an input for the 240V mains and then three switched mains output on the right. I decided to use opto-isolated triacs to switch the mains to the lights as they’re easy to use and safe. There are two versions – one which switches the mains at the point the AC signal hits zero (zero-crossing) and one that you can switch at any point in the AC cycle. Well, it just so happened that parts I had lying around my workshop were the zero-crossing type. These are great if you want to switch loads without inducing electrical noise in other devices, but if you want to dim lights they are as much use as a chocolate fireguard. Hence, a quick order to Mouser Electronics to fix what I initially thought was a software problem…many wasted hours in front of the keyboard! So, the opto-switch that I ended up with is the Omron G3MC-202PL which is not expensive and is very neat. At the time of writing, the board has the abililty to switch the three light output on and off and to set the brightness level. I can also send commands from my RaspberryPi using MQTT messages to change the intensity levels of all outputs. A short press on a spring loaded light switch changes from on to off, a long press cycles the brightness up and then down again. As soon as you release the switch the brightness level is remembered and then that is the ON level until you change it again. Currently, we’re in Spain going through meetings with our architect, Manel, and our aperjador (structural engineer) Alfonso, so I haven’t been able to complete the software. However, an inspiration as I lay in the sun the other day was to allow the units to be linked together without a server so that they can work in a standalone situation. This would be handy so that I could use one unit with as a master switch, say, near the front door of the house to turn all the lights off or restore them to their previous state which will be really useful if we’re going out for dinner. So, each unit will have a list of other units that it can switch. Of course, these could be anywhere in the house or I guess potentially anywhere in the world it was felt that was useful! I’ll add to this post as I get more of the software finished and also upload a video of the switches operating. How do you find water without a geological survey and an orbiting satellite? David, our agent, recommended that we employ the services of Juanito to locate water on our land as, whilst there are a couple of rundown porthos (wells) that we’ve found, the amount of water available is miniscule for modern living and certainly couldn’t be used for irrigation. Yes, we can and will get water from the cisterna and borehole located about a mile and a half away, but there’s nothing like having your own water source to be properly off grid. I mean “off grid” means just that, doesn’t it? It doesn’t mean “connected to a community water tank up the road”! So we met up with Juanito who is a very charming 82 year old and is fit as a fiddle. We met at the old house on our land and it was immediately apparent that he had already done his homework as he clearly knows the geology of the area intimately. He wandered around for an hour or so, going into each of our three valleys, before he settled on the middle one as the most likely candidate for water. We stood and watched as he clambered across the hillside like one of our local ibex, a real mountain goat. He seemed to slowly zero in on the top corner, just below one of the tracks which leads down about half a mile from the house. We watched him quarter back and forth like a hound on the scent of a fox. Could he smell something? He was carrying what looked like a y-shaped piece of hazel wood – in fact two bent twigs bound together with grey duct tape. Very scientific I don’t think and I didn’t expect much other than the usual pseudo-scientific mumbo jumbo. Eventually, he waved to us from across the valley and I peeled Helen from out of the air-conditioned car as it was very warm. He then walked back and forth, holding his bent twigs and then indicated a spot. “There are two large water flows below us”, he proclaimed. “You have a huge amount of agua here, very lucky!”. Apparently, he reckoned that the two flows crossed – one at around 165m and the other at around 190 m deep. I mean, 190m below us! How on earth? My skepticism must have shone like a beacon as he handed me the twigs and told me to have a go myself. I held the wooden water detector in the way he showed me and walked back and forth across the area and, blow me, the twigs practically tore my hands off! I couldn’t stop them from dipping no matter what I did and at the same point every time. Helen couldn’t resist having a go and the same happened for her. According to Juanito, only about one in 20 pepole can do it and it’s very unusual for both of a couple to be able to do it. Just lucky, I guess. So, what happens next? Well, we have to pay around 8000 euros for the company that our divine water finder works with and they will use a pneumatic boring machine to drill a 20 cm shaft down to the water and line it with nylon sleeving to prevent collapse. We then drop a submersible, high pressure pump down the borehole and thar she blows…in theory. So, I asked the obvious question; what happens if they don’t hit water? Well, said the man, you don’t pay a single euro. So, if it works, we have unlimited free water (about 20m3 per hour he reckons) and we pay; if it doesn’t, we don’t pay. Well, the company is still in business is all I’m saying. How does it work, if it works? According to Juanito, there have ben 30,000 year old cave paintings discovered in the sahara showing people holding bent sticks like his. So, either they’re antennae to talk to aliens or they’re water divining rods. As he said, the primitive ancients couldn’t spare the resources to just keep on digging deep holes in the sahara desert to find water, they had to know where to dig – and dig they did, resulting in the lines of wells that have fed the caravanserai across the desert for millenia. Unless of course, it was those pesky aliens spotting water from orbit? Here’s a video of us locating the water – apologies for the slight blurriness. We decided that the first stage in developing and building the house would be to get all of the services in place. This means that we need to build the solar farm, bring the water from about a mile and a half away and build a workshop/garage (almacen in Spanish). If you have looked at my omegaman.net blog, you’ll know that I am a confirmed tinkerer and, as such, I just need a workshop. So, the plan this summer is to install the solar system, bring in the water, dig in a septic tank and build an alamcen. So, power and water in, poo and wee out! The Great Plan indicates that we’ll be going down this summer to start laying out the foundations of the main house and to get to know the land a bit better. So, we could simply stay in a hotel or even rent a house, but where’s the fun in that? The answer is staring us in the face, we’ll make the almacen habitable. Seemples? You can see on the plan that there’s a shower and a loo in the corner of the almacen. Next to it is a tap which will probably end up being a simple kitchen sink with a table next to it to take a small 2-ring, electric cooker and a benchtop oven/microwave. Add in a barbeque and that’s pretty much all you need for a few weeks of summer living in the sun. Oh, and wine of course. Well, somewhere to sleep would also be nice. So, up in the roof of the alamcen will be a wooden mezzanine floor where we can put a bed. Of course, even in the mountains of Aragon (doesn’t that sound very Lord-Of-The-Rings-ish?) it gets a tad hot in the height of the summer, so I’ve found a great reversible aircon unit surplus on Ebay. It’s a variation on the type you used to see in the USA and the Far East, where it’s jammed into an open window and just plugged into a power socket. It’s quite a meaty unit, intended for larger rooms and will also heat as well as cool, so when we’re there in the winter and I feel the need to build something, I’ll be able to heat the alamcen as well as cool it in the summer. The power consumption is about 900W for 3.2KW of heating or cooling, so the solar and battery system should have no problems running it 24/7. One final element is the dog pen. This means that we can take our eight dogs – six chiahuahuas called Bolly (the mum), Gizmo, Juju, Livvy, Casper and last, and very much the least, Coco. Travelling with us will also be our two wolfhounds, Otto and Bertie. The dog pen will give us a bit of peace of mind when we go out, so that at least we know that the wolfhounds won’t be running off chasing wild ibex over the cliffs and that the little dogs won’t be taken by any of the local raptors. We’re thinking about investing in kevlar jackets for the chiahuahuas. We’ve rented a house for a week in early May, after our local elections, but before the recently announced General Election in the UK. So, we’re going out to organise the building of the alamcen and catch up with some new friends that we’ve made who are about 9 months ahead of us in the construction process. I’m looking forwards to seeing how they are progressing.